That’s the day that I had to give the girls their B12 injections myself for the first time. A couple days before that was when they began the injections from home visiting nurses. It’s August 31st. Two months. I’ve been giving them injections every single day for two months. Every single morning I refused to think about it until I absolutely had to. I went through the motions of washing my hands, sanitizing the equipment, filling the syringes, getting the gauze and band-aids ready and opening up a new alcohol wipe. Then I’d head to their room with needles in my hands. the second I walk through the door both of the girls look over and squeal and smile. They’re so happy to see me. I feel so guilty for what I’m about to do. We immediately made the necessary calls on each of our ends to make sure that a local lab could do MMA blood draws anytime for the next year and we were set. It will take a while to figure out just how bad, or hopefully mild, their B12 problem is. Thankfully we have it under control now though and we’re making attempts to keep them off of needles for good. 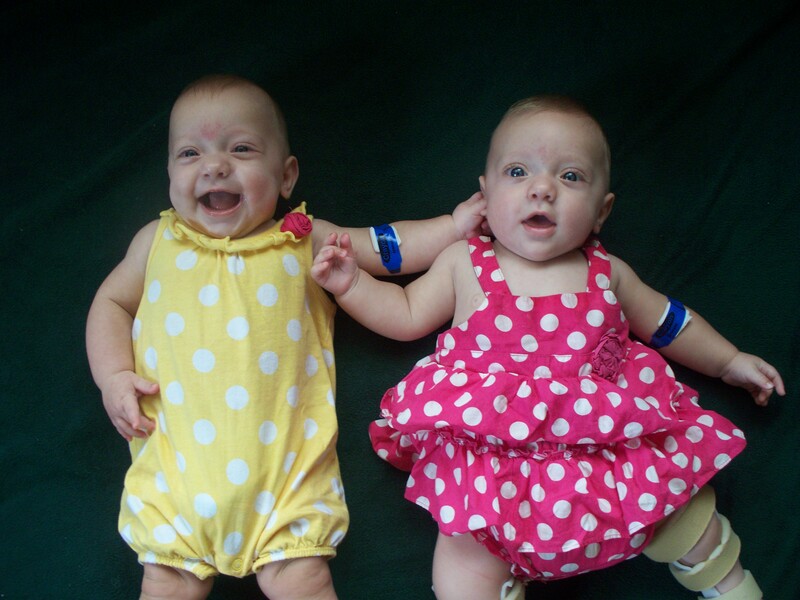 We had their first blood draw today, and we’ll be starting the oral droppers tomorrow. After a week I’ll be taking them back to see how they reacted to it. I’m praying with all of my heart that their levels stay the same. I have a feeling I’ll be losing even more sleep over the next week just praying that this works. Peanut also has a pretty rough month coming up. First is this B12 test run. Then she’s got an MRI she’ll have to get sedated for a week after to check out her lower spine to try to start diagnosing her paralysis. Then, on Sept 26th she’s got a surgery booked. It’s a tendon release for her clubbed feet. This is what I’m really scared for. I’ve been trying not to think about it but I’m honestly really upset by this. No… if I’m really going to be completely honest I’m scared to f@cking death. All 13 pounds of her will be put under anesthesia for two hours. I’m so terrified something will go wrong while she’s put out. I’m scared she won’t wake up again. She’s so tiny. Something, anything could go wrong so easily. I try so hard not to think about it. When I do finally talk to some people about it they tell me to chill out and it’ll be fine. Don’t tell me not to worry about it and they’re professionals. That’s like asking water not to be water. I’m a Mom for god’s sake. It’s my job to worry and fuss. God… I don’t even want to know how I’m going to be the day of her surgery if this is how I am now… I’ll cross that bridge when I get there. I have a feeling husband will be dealing with either an emotional rock or a waterfall of emotion. Until then though, all I can do is just keep plugging along. Work and worry. For those of you that regularly keep up with our life and know the trouble the girls have been through so far, can you please pray for them? Pray, cross your fingers, cheer, hop on one foot, wish upon a star… whatever it is you do that brings you good fortune and happy endings, can you pass that along to my girls please? I am praying with all of my heart every single day. That’s all I ask. We’ll deal with the rest, but I just want them to get through all of this as unscathed as possible. I also want to take a moment to say thanks to all of you, and thanks for following our journey this far. It’s been a really rocky road from the start when the girls arrived, but husband and I couldn’t have made it this far without all of your support and love. For those of you that have sent cards, money, well wishes and prayers we can’t thank you enough for your kindnesses. Not to mention those of you who have sacrificed your own time and efforts to come and help us, babysit our kids when we’re dealing with hospital errands, given us endless amounts of clothes and toys for our kids, cooked us MOUNDS of food to help us get even a little bit of free time. We love you all. I truly don’t think we could have asked for better family or friends. You are all amazing. I will be praying Rachel!!! You’ve made it this far – you can do it! Also, I have this on my desk because I regularly worry (my grandma was a big worrier, my mom says I get it from her): “Can any one of you by worrying add a single hour to your life?” Matthew 6:27. Also, from the same gospel: “Therefore, do not worry about tomorrow, for tomorrow will worry about itself. Each day has enough trouble of its own.” Matthew 6:34. Thanks Jen, it really does mean a lot! I love those quotes, thanks so much for sharing them! You are so right. I know it deep down, but I just can’t help but worry. I’m sure you know what I mean. My sister made a good point in making me feel better the other day too. She said, “Well, Peanuts had some pretty bad stuff happen, so technically she’s getting all of her bad out of the way now and she’s good to go.” I know it doesn’t really work that way, but it makes me feel like I’m getting through the worst of it and there’s a light at the end of the tunnel. Dammit it DOES work that way. . . . statistically.